Coming home from a night of celebrating, you might find yourself at a loss when you try to get back into your house. If you can figure out which key is the right one, fitting it into that confusing little slot may require more motor skills than you possess at that moment. 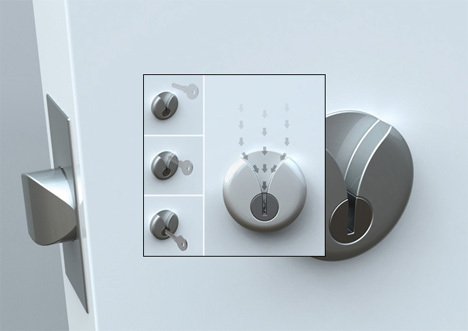 It’s no problem if you’ve got the V Lock (created by designer Junjie Zhang) installed. 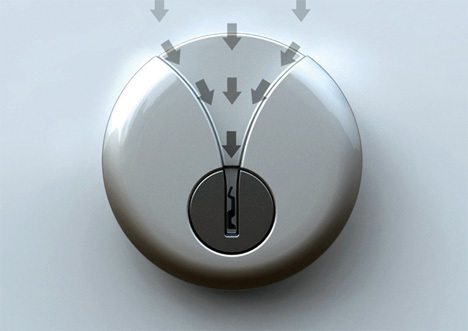 The V Lock is just a regular door lock that includes a V-shaped channel extending from the very top to the keyhole. This channel makes it simple to find the keyhole by providing a direct path for the key to follow. This innovation isn’t only for people who’ve had a bit too much to drink, however – it can also be helpful for vision-impaired people or those whose motor skills have degraded enough to make activities like unlocking a door difficult.